This realistic rubberwood cash register offers magical make-believe fun for younger children, and educational entertainment for older kids. 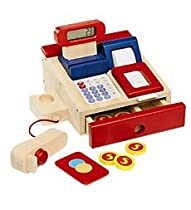 It has everything they need to be the best store clerk on their block: working calculator, digital display, paper roll for notes and calculations, pretend money, bank card, and a scanner that sounds like its grocery store counterpart. Requires cell-button battery, included. Adult assembly. For ages 3 and up. Size: 8″L x 4″W x 7″H.